Two-for-ones have long been accepted as a key part of smart coaching. But are they really as valuable as we've come to believe? Contributor Positive Residual investigates. This article is a collaboration between Ben and a contributor who goes by the name Positive Residual (he’d rather his basketball work not interfere with his full-time job, and thus uses this pseudonym). Positive Residual focuses on basketball analytics and data visualizations. He is a contributor at Nylon Calculus, and you can follow him on Twitter @presidual. They were the kinds of plays you’d expect from an analytically savvy team like the Houston Rockets. In a February game against the Miami Heat, PJ Tucker grabbed a defensive rebound with 40 seconds left in the first quarter. He promptly handed the ball to Chris Paul, who dribbled up the court, motioned for a high screen, and executed a pick-and-roll that led to a Nene and-1 at the rim. The play took 8 seconds from start to finish. After Josh Richardson missed on the ensuing possession, the Rockets had another chance to build their lead, although Paul’s 3-pointer fell short at the buzzer. The following quarter presented a similarly interesting set of events. 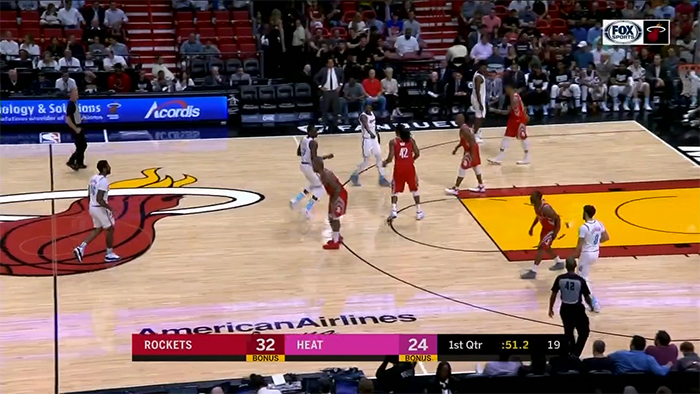 With 55 seconds left, James Harden received the inbound pass and dribbled toward a screen set by Paul at halfcourt, hoping to induce Goran Dragic to switch onto him. Eventually, Paul ended up with the ball at the 40-second mark and paused for a brief yet noticeable moment. After Nene arrived to engage in a pick-and-roll, he drove to the basket and hit a six-foot floater as the shot clock expired. Dragic subsequently drew a 3-point foul that cut Miami’s deficit, but the Rockets had 12 seconds to take the final shot of the half. Based on these remarks, we might expect the Rockets to lead the way in two-for-one frequency. But they actually don’t. If we look at all possessions that begin at 40 to 45 seconds in the first through third quarters since the 2007-08 season, we see that about 38% of them finish at 30 to 34 seconds. The Rockets are at 41%, or eighth in the league. Over the past five years, as the NBA has gradually increased such two-for-one usage, they’ve been right around the middle of the pack. Some of this stagnation can be traced to Kevin McHale’s last full season and J.B. Bickerstaff’s interim stint as head coach, when the Rockets slipped below average. 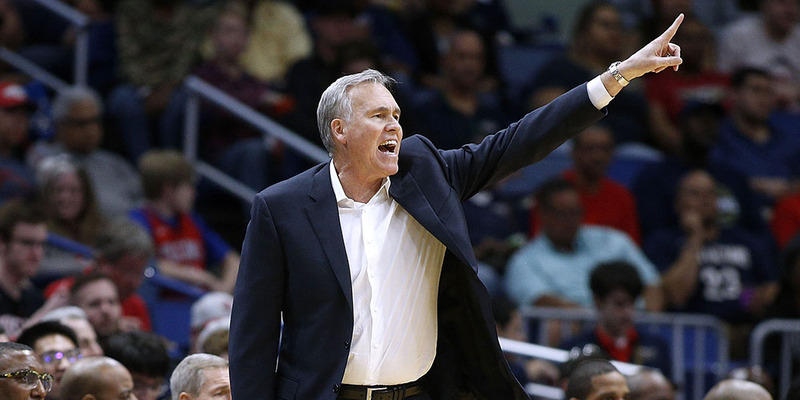 But even Mike D’Antoni’s inaugural campaign was at a bottom-ten rate, and only this year have they risen, as the Heat game suggests, to a top-five frequency. How can that be? If the math is purportedly so compelling, why does Houston appear to deviate from it every now and then?